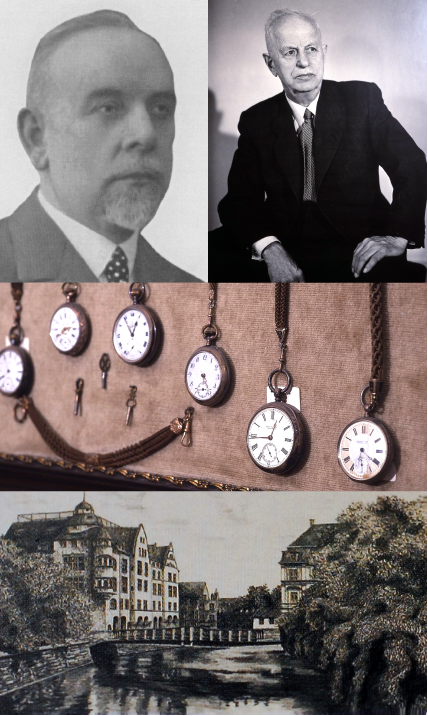 In 1907, at the famous goldsmith town of Pforzheim Germany, Heinrich Henkel and his brother-in-law Florentin Grosse established “Süddeutsche Gold-und Harrbijouterie-Fabrik Heinrich Henkel und Co” (South-German Gold and Hair Jeweller) specialized in producing jewellery and watch chain made of woven and plaited hair. After World War I broke out in 1914, demand for Grossé’s modern and fashionable watch chain, which was woven with the long hair of loved ones, was prevalent among young people entering the battlefield. This jewellery made of hair was extremely popular, even beyond the borders of Germany, in Europe and as far away as India. In 1918, after the end of World War I, the era of liberation and social advancement among women began. The women took off the corset that ties the body and enjoy freedom and independence. Costume jewellery has become an important element to complete the new fashion. 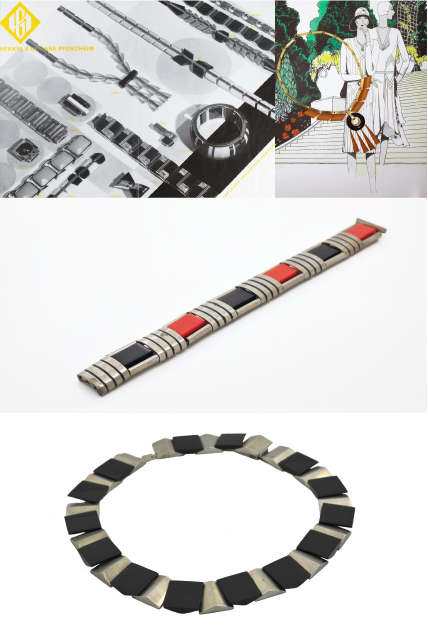 In tune with the times, Grossé introduced state-of-the-art modernist design, manufactures avant-garde costume jewellery that combined art and technology. 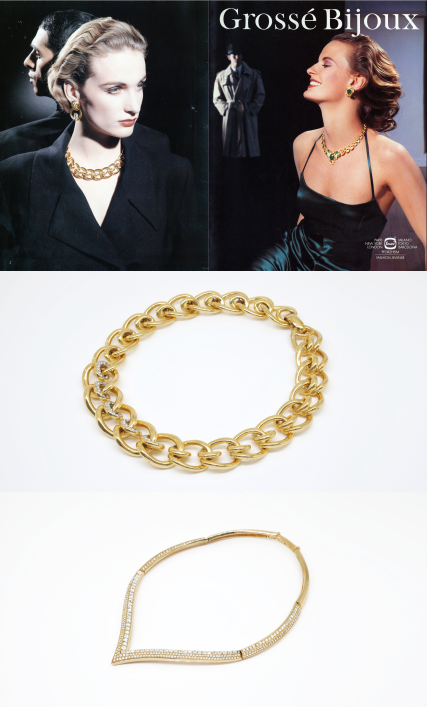 This new design-driven costume jewellery received wide critical acclaim, drawing attention and interest from major houses, such as Lavin and Chanel. The stock market crash of 1929 and the ensuing global economic crisis put a sudden end to the modernism of the roaring twenties. Atmosphere in the world became a conservative. In the 1930s, trend of femininity returned, and designs were moving to softer curvaceous and figurative forms. 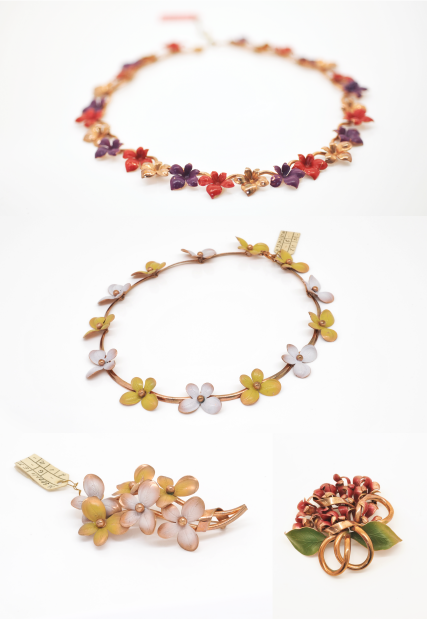 In parallel, Grossé came up with a series of colourful flower jewellery that is symmetrical with a concise art deco. New technical innovations, such as the processing of synthetic lacquers, were implemented. These floral jewels drew the attention of Elsa Schiaparelli (1890-1973), who was active as a representative designer in 1930, and Grossé produced a series of jewels for her, including a red flower necklaces and a fruit brooch. In 1937, at the Paris Exposition Universelle des Arts et Techniques dans la Vie Moderne, Grossé won the highest honour medal in both the technical and designing section of costume jewellery. Many Hollywood celebrities such as Marlene Dietrich and Greta Garbo, who were great fashion icons of the time, big actresses of the silver screen, became familiar with this achievement, and became customers of Grosse. Especially Dietrich bought all the stocks that were in New York in Grossé, became a big topic at the time. At the end of the thirties, when resources were becoming scarce due to the emerging of World War II, Grossé started to make new pieces from the materials and elements that were available such as balls, cylinders, hinges and tubes. 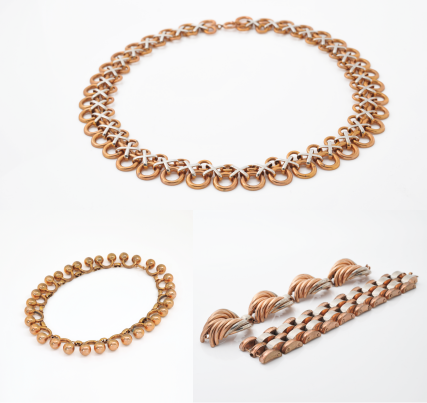 Despite the inexpensive materials used, the processing did justice to the shapes and materials used so that the results were comparable with real jewellery. Just before the end of the Second World War in 1945, the town of Pforzheim, where the factory of Grossé was located, faced a major air raid. Most of the city had been destroyed, 17,000 people were killed and Grossé's company premises were completely destroyed. Nevertheless, passion to make jewellery did not vanish even the war had burnt down everything. Out of the rubble of the factory, Grossé salvaged some old machines and left-over metal from a small cellar, and resumed to make jewellery. 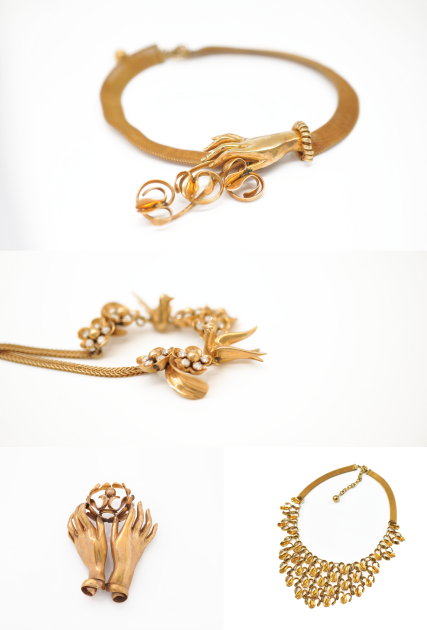 At this time, Grossé jewellery concept was mainly praying for the peaceful world that women can dress up beautifully, with the thought of "Once again, all women can dream and sparkle". Christian Dior launched “New Look” Collection in 1947, exaggerated the female form with its structured bodice, tiny nipped-in waist, and long circle skirts that used several yards of fabric, and the elegant and feminine “Figure 8” (or named “Carolle”) collection has brought about sensation. In the 1950s, Dior launched new lines one after another, such as "H line", "A line" and "Y line". It was the heyday for elegance. At the same time, Grossé's jewellery was gaining in popularity among European jewellers as it’s quality is recognized to be as good as real jewellery but at a more affordable price, which gave inexpensive alternative to a new, larger clientele. Christian Dior, who breathed a life in New Look, advocated a total look up to not only clothes but also details, such as hats, shoes, bags, perfumes, jewellery and so on. When Grossé started selling jewellery in Dior boutique, the success was great, and Christian Dior highly appreciated the quality of the work and concluded a partnership with Grossé in 1955 under his strong request. 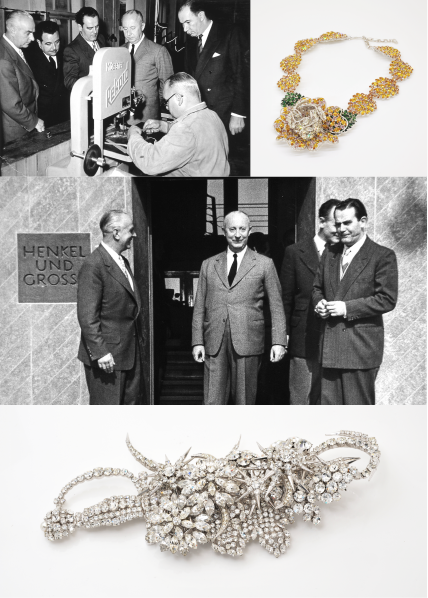 Over the next 50 years Grossé was responsible for the production of Christian Dior Bijoux and had the right to sell it and sent out numerous masterpieces to the world. Even in the history of Dior, such a long term license cooperation was unprecedented. Grossé continued to flourish regardless of the turbulence in politics, such as the Cold War, building of the Berlin Wall and the Vietnam War. Fashion transiting from Haute Couture to prêt-à-porter garments, from designed primarily for celebrities towards the mass market and an ever younger clientele. Grossé continued to create its own line without subjecting itself to the rapid changes in the world of fashion. With the skilful metalwork and by using more natural gem stones in the collection, Grossé continue to aim for the same standard as real jewellery while being a costume jewellery. With the new developments in the chain sector, Grossé saw a huge increase in sales. In US, growth rates were so high that a second production site was set up there. In the sixties, Europe had been shaken by the youth revolts, which culminated in the student riots of 1968/69. The young generation was longed for a culture of its own that was independent from the establishment and conventions. This revolution found its way into fashion by way of jeans and mini skirt. 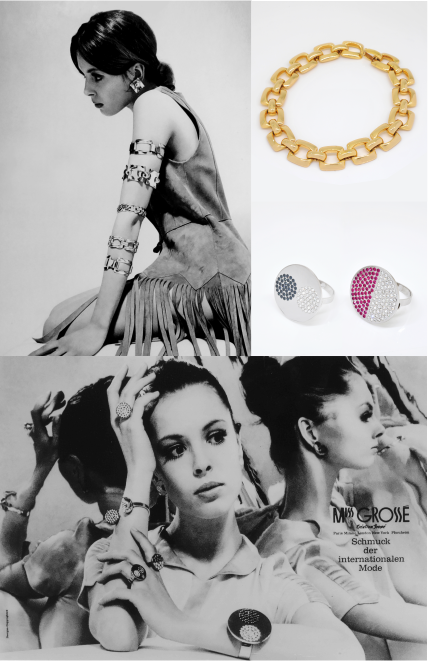 In the early 1970s, influenced by the cool “space design” developed by Courrèges and Paco Rabanne, Grossé came up with bold creations, which marked a clear departure from the elaborate, naturalistic costume jewellery pieces of the sixties. Due to the oil shock in 1973, the economy became confused and the economy deteriorated, costume jewellery replaced the fine jewellery. In the late 1970s, fashion brands were booming and creativity brands gained popularity. Capitalism prospers as communism and the Berlin Wall collapse and rapid economic growth is achieved. An era in which women wore clothes with shoulder pads, self-reliance, piloting carriers, and more emancipated. Rejecting the traditional associations of precious jewellery with male ownership, women embraced the freedom and fantasy of fashion jewellery. 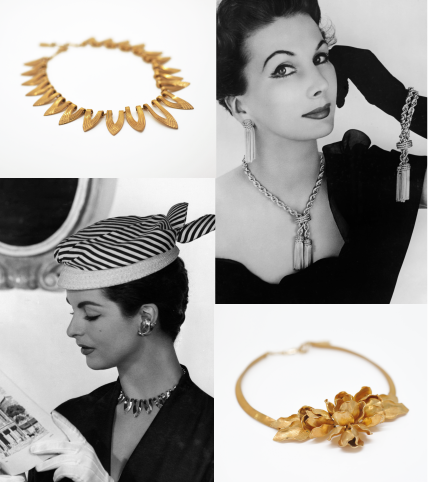 It was the golden age of costume jewellery, where women worn jewellery in every occasion and at all times of the day. In response to various preferences and demand, Grossé expanded its production with some 300 new designs each season. In 1983, Grossé diffusion collection was launched in order to expand the variety of Grossé products category, including leathergoods, scarves, ties, muffler, etc. With the 1990s and the impact of grunge came a cleansing period after the excess of the eighties and return to cool minimalism. Fashion was no longer as dictatorial as it had been before, but entering into an intense new phase marked by the quest for individuality. Anything you liked was permitted – distinguished elegance, the cool, casual look or romantically fanciful “nostalgia” look. With the rapid change in new fashion trends and styles, Grossé designs endured to align with the requirements of such diversified clientele, taking a more contemporary approach, reflected independence and personality. In the nineties, with advance technology and globalization, it became possible to transfer production bases of companies to overseas, and the fashion industry entered the "big movement period" in search of cheaper labour. The 2000s are often described as a "mash-up" decade, where trends saw the fusion of previous styles, global and ethnic clothing, as well as the fashions of numerous subcultures. To celebrate its 100th anniversary, Grosse held a marvellous Jewellery exhibition and Gala Dinner at The Venetian Macao Resort Hotel in Macau in 2007. With the technology breakthroughs and incredible growth of the Internet use since 2000, it had not only changed the fashion industry but the whole world. People can now search for information immediately from the internet, sharing photos and ideas, and buy anything on the internet and easily be shipped from anywhere in the world, all in a snap of a finger. The youth are playing an ever more important role in fashion now. In response to this enormous change in consumer behaviour and culture, Grossé created new value through collaboration with celebrities and designers, making full use of design power and technology. It was selected as a gift of the official gift lounge of the Grammy Awards held in Los Angeles, it had been exhibited twice in 2011 and 2017, and it became very popular among celebrities. Grosse's history which has been loved by celebrities since its establishment is still continuing. 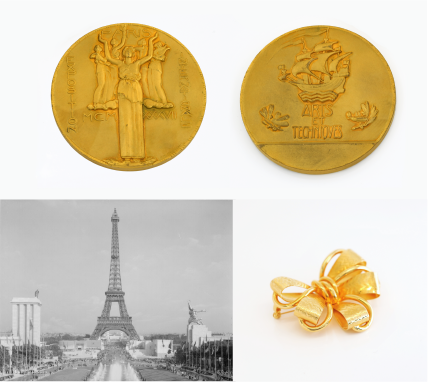 In 2017, to celebrate its 110th anniversary, Grossé held a world exhibition tour in Pforzheim, Japan and Taiwan, showing its precious vintage jewelleries and were highly praised by the media.